Opinions are often interesting and sometimes entertaining. But what do we learn from opinions? It’s more useful to understand the science behind the subject. What is this particular theory built on? How long has the theory been “established”? What lines of evidence support this theory? What evidence would falsify this theory? What do opposing theories say? Now I would like to look at impacts of climate change. And so opinions and value judgements are inevitable. In physics we can say something like “95% of radiation at 667 cm-1 is absorbed within 1m at the surface because of the absorption properties of CO2″ and be judged true or false. It’s a number. It’s an equation. And therefore the result is falsifiable – the essence of science. Perhaps in some cases all the data is not in, or the formula is not yet clear, but this can be noted and accepted. There is evidence in favor or against, or a mix of evidence. As we build equations into complex climate models, judgements become unavoidable. For example, “convection is modeled as a sub-grid parameterization therefore..”. Where the conclusion following “therefore” is the judgement. We could call it an opinion. We could call it an expert opinion. We could call it science if the result is falsifiable. But it starts to get a bit more “blurry” – at some point we move from a region of settled science to a region of less-settled science. And once we consider the impacts in 2100 it seems that certainty and falsifiability must be abandoned. “Blurry” is the best case. Less than a year ago listening to America and the New Global Economy by Timothy Taylor (via audible.com) I remember he said something like “the economic cost of climate change was all lumped into a fat tail – if the temperature change was on the higher side”. Sorry for my inaccurate memory (and the downside of audible.com vs a real book). Well it sparked my interest in another part of the climate journey. I’ve been reading IPCC Working Group II (wgII) – some of the “TAR” (= third assessment report) from 2001 for background and AR5, the latest IPCC report from 2014. Some of the impacts also show up in Working Group I which is about the physical climate science, and the IPCC Special Report on Managing the Risks of Extreme Events and Disasters to Advance Climate Change Adaptation from 2012, known as SREX (Special Report on Extremes). These are all available at the IPCC website. The world community faces many risks from climate change. Clearly it is important to understand the nature of those risks, where natural and human systems are likely to be most vulnerable, and what may be achieved by adaptive responses. To understand better the potential impacts and associated dangers of global climate change, Working Group II of the Intergovernmental Panel on Climate Change (IPCC) offers this Third Assessment Report (TAR) on the state of knowledge concerning the sensitivity, adaptability, and vulnerability of physical, ecological, and social systems to climate change. Within the field of papers and IPCC reports it’s clear that CO2 increasing plant growth is not ignored. Likewise, there are expected to be winners and losers (often, but definitely not exclusively, geographically distributed), even though the IPCC summarizes the expected overall effect as negative. Of course, there is a highly entertaining field of “recycled press releases about the imminent catastrophe of climate change” which I’m sure ignores any positives or tradeoffs. Even in what could charitably be called “respected media outlets” there seem to be few correspondents with basic scientific literacy. Not even the ability to add up the numbers on an electricity bill or distinguish between the press release of a company planning to get wonderful results in 2025 vs today’s reality. Anyway, entertaining as it is to shoot fish in a barrel, we will try to stay away from discussing newsotainment and stay with the scientific literature and IPCC assessments. Inevitably, we’ll stray a little. Covering the subject is not easy but it’s an interesting field. Long range climate forecasting is very blurry indeed. We can’t even get good short-range climate forecasts for a few months or a year. So, I have little confidence in longer predictions or projections. An honest impact assessment must include both positive and negative impacts. The positive impacts of higher CO2 levels and warming are likely to be very substantial, mainly through increased agricultural production – through increased plant growth and drought resistance, as well as expanded growing season and spatial range at higher latitudes. My understanding is that the expected warming should be mainly at higher latitudes, and this would decrease the temperature gradient from equator to poles and thus reduce the baroclinic driver for large storm systems at higher latitudes (which probably are dominant in the global energy balance/redistribution over tropical cyclones). Consequently, I would expect a general lessening of severe weather at the higher latitudes in association with this warming. I’m probably just showing my age, but I really dislike the use of the word impact instead of affect or effect. I suspect it’s because a lot of people don’t know when to use affect instead of effect. Either that or they think impact is more dramatic. That might have been true once, but probably not now. SOD, the big ones you have missed are increased disease, and increased populations of pest species. The former is complicated because greater warmth reduces the incidence of some diseases (eg, pneumonia); but it increases the risk of some of humanities biggest killers. Further, many of the diseases are controllable by extensive measures, so the impact may be increased cost and reduced reliability of control measures rather than in terms of death toll. Likewise, pest species populations can be controlled, so the impact may be in terms of increased costs controlling pest species. With regard to the latter, to basic factors are in play. First, up to a significant temperature, the primary effect of increased heat on cold blooded creatures is that they live faster (are more active). That in turn means it takes more strenuous measures to control them if they are pest species. Second, because volume increases roughly with the cube of dimensions, while surface area increases with the square; increased temperature creates problems with cooling for large warm blooded creatures (a category including humans, cattle, and indeed, anything as large as or larger than a sheep) far more than for small warm blooded creatures (a category including many pest species). Finally, at the upper end of temperature responses, or in 150 plus years of BAU regardless, temperatures will increase enough that at some times of the year, for large areas of the Earth, humans will be unable to effectively shed heat unless they resort to more or less continuous active cooling measures (air conditioning, mist sprays etc). For practical purposes that will make those areas seasonally uninhabitable. The same problem will apply to large livestock. Technically this could come under heat waves, but its effect is significantly greater than what we would normally expect from a heatwave. Thanks, I made a couple of additions to the article. SOD: Since biodiversity generally increases with temperature, especially in areas with adequate rainfall, you might discuss the benefits of increasing biodiversity and include the losses caused by migration of a few of these species that are pests as a sub-category. I suspect we will address many of the losses caused by pests and disease EVERYWHERE in the world with technology, so there may not be any need to mitigate the slow spread of some pests to a few new areas due to global warming. This assumes that the anti-GMO Luddites don’t prevail and we don’t invest all of our discretionary funds reducing CO2 emissions. FWIW, the most costly pests that don’t cause human disease are generally foreign species that have been carried to new locations without effective predators and hosts or prey without natural resistance. They are also the most common cause of extinctions, which currently mostly occur on isolated islands. Likewise, HIV, the 1918 flu epidemic, bubonic plague, and the decimation of Native Americans by European diseases were all caused by “foreign microbes”. Tom, the increase is mainly at night, at higher latitudes, and in winter, with only a small increase in greater hot times. i.e, milder weather, not much hotter. In addition, the increases in the hotter weather are very small, so hot increases for warm blooded animals are not a big issue, and this is true for pests. There is NO data that supports that there is mare heat waves, drought, storms, flooding, etc. than in reasonably past history. It is also a fact that there is far more deaths in cold weather or climate than hot. The greening due to CO2 is quite evident. What exactly is your issue? I agree with Leonard. This idea that “parts of the Earth will become uninhabitable by humans” is a little far fetched and requires a perfect storm of improbable facts. Even in the age of the Dinosaurs, when the poles had alligators and dinosaurs, mammals thrived by being nocturnal. Pestilence and disease are the same thing. What you want is a word meaning increase in population and diversity of pest species. I can’t think of one off the top of my head. Well, more or less the same. A pestilence, strictly speaking, is a fatal disease like bubonic plague. It felt as if it had more literary quality. Anyway, I updated the update. I wonder what the impact of that would be! One possibility is a detrimental solution in the form of a unilateral state action… geoengineering… war. The total estimated biomass of the pelagic compartment remained relatively stable during each of two main periods (before and after 2004), but increased by a factor of two from around 11 million tonnes in the first to around 23 million tonnes in the last period. I tend to support the theory that C. Megalodon, the giant cousin of today’s Great White Shark, went extinct because the cooling ocean didn’t provide enough food. The drop in sea level when the continental ice sheets formed probably didn’t help either. We’re guessing wildly when we ascribe specific reasons for the extinction of great great white sharks or indeed any long-gone species, and we might not be much better at describing current extinctions. Speciation occurs all the time as a response to changes in the environment, both gross and subtle. Species which find a new niche in which they are particularly successful become ‘trapped’ by that success, and as their gene pool gets more uniform, they become more vulnerable to smaller, later changes. Other species – I call them ‘weed’ species – whether they are plant or animal – radiate to take advantage of the new conditions, but in turn may ‘settle down’ to a cushy existence, until the world turns again. Sure, man has changed the face of the earth more rapidly and extensively than anything before him, but the resilience of the natural world never ceases to surprise us. Of course we should regret the passing of any species, but we shouldn’t elevate it to anything more than a limited, or ‘hobby’ interest. Extinctions are of far less significance to human well-being than is often assumed. How about the general statement that people will be competing,fighting, whatever method for – literally – the “Higher, Northern Ground”. Not only getting away from the sea coasts because of flooding, but to live where it is cooler.For instance, In the U.S. there will be migrations away from, say Louisiana and Florida, to Colorado and parts of Canada. 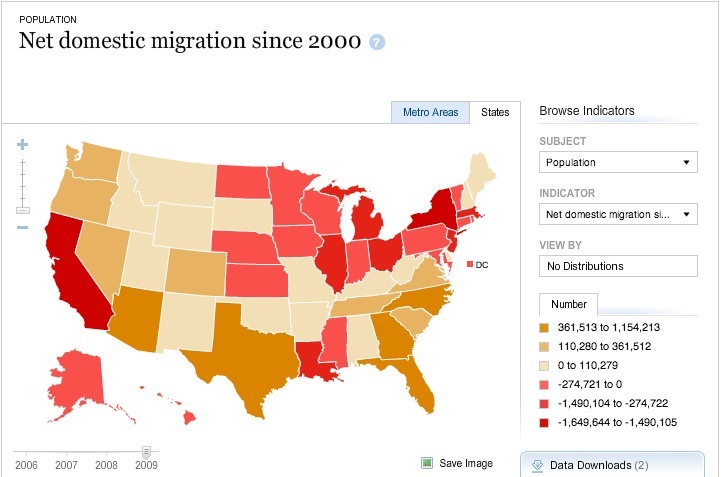 For 2000-2009 ( not a representative ending year because of the financial crisis, and multiple factors apply, of course), looks like the trend is still the opposite, migration to Lower, Southern ground. Curious: The general statement is a gross exaggeration. If you look at the US away from the moderating effects of the ocean (and associated microclimates in some coastal areas), mean annual temperature rises about 1 degC for every 100 miles you travel towards the north. Furthermore, most warming is predicted to occur at night and during the winter and that will make many locations more pleasant, not less pleasant. Therefore, no one needs to travel very far to the north to compensate for past and current GW. And no one pays attention to differences of a few degC; this is the difference between a cool summer and a warm summer. Mass migration is a fantasy. There has been a mass migration TOWARD low coastal areas stimulated by technology and government policy. Large areas of wetlands near sea level and rivers have been drained, temporarily protected and settled by millions of people. Most people can’t build homes without loans and no one makes loans on property that isn’t insured. Unfortunately, our government subsidizes flood insurance in areas threatened by flooding and storm surges – subsidies that makes it practical for people to live there. Most of the need to flee to higher ground has been caused by poor policy, ignorance, and poorly informed citizens who rely of the government to protect them from their own poor judgment. I doubt there will be any migration away from these areas until after government policy changes.